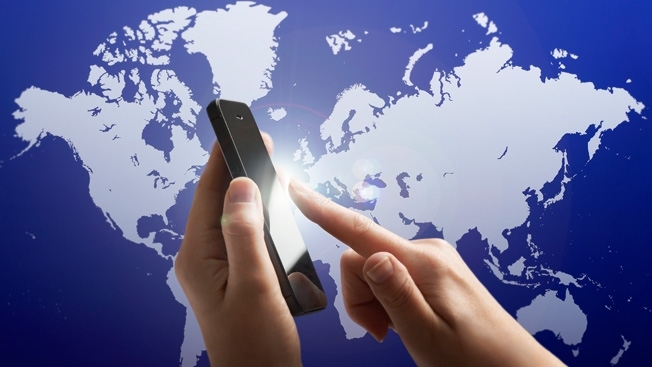 Can Mobile Rule the Ad World? 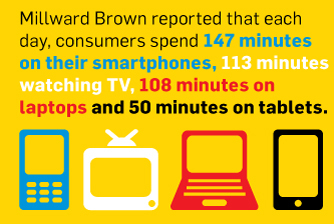 This article from AdWeek is putting mobile, the small screen, front and center where it belongs. See below why mobile should be highly considered over other alternatives. For years, mobile was seen as a slick sideshow—the possibilities of engaging people on a platform that commands, even consumes their attention has always held great promise but also appeared doomed to disappoint. 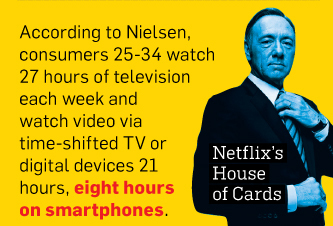 Neither the marketing nor the metrics were ready for prime time—remarkable considering how much most of us live on our devices. But as native, programmatic and location-based ads continue to roll out, could mobile advertising be poised to overtake other media? While some industry insiders scoff at the suggestion that TV will ever take a backseat to smartphones and tablets, there are others who are quite bullish. The turnaround appears to be well underway, in fact. Mobile sales figures at both Facebook and Twitter are soaring, with each enjoying double-digit gains per quarter. 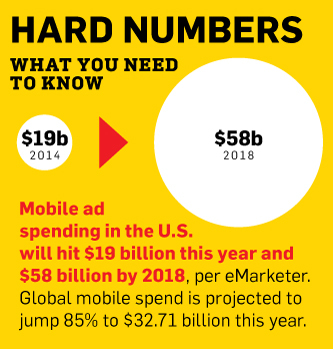 Meanwhile, the process of advertising on mobile devices may have just gotten easier. Facebook today will introduce Atlas, which is designed to help marketers track campaigns across smartphones, tablets and desktops. Also this week, Nielsen is expected to pitch the TV networks a measurement tool that will pair mobile views with TV ratings. Google is also set to debut rich media ads for mobile. But even as change is in the air, not everyone believes marketers are moving fast enough to keep up. Hofstetter was able to convince client Red Roof Inn to invest in mobile video ads in recent months. Those ads did so well for the hotel chain that it boosted its fourth-quarter mobile spend by 25 percent. All the while, the ratings of the Big Four broadcast networks continue to erode. And for the first time ever, cable and satellite subscriptions last year declined versus the year prior, per research firm IHS. To say that the TV business is troubled is to deal in hard truths, of course, and yesterday’s news. ESPN, which dominates so much of DVR-proof live sports programming, appears on the winning side, however. This past April, the cable net revealed that the majority of consumers of its digital video content tuned in via smartphones and tablets, reaching a peak of 57 percent in August. As a result, ESPN is working to enhance high-def mobile viewing to service consumers and advertisers. This entry was posted in App Development, Mobile Advertising, Mobile Search, Multi-Screen. Bookmark the permalink.